Each Sunday Talk highlights a specific area of spiritual life. Most are a part of a larger series, such as the Love Series and A Purposeful Life Series. In these audio files, Caru Das (a 40-yr devotee of Lord Krishna), clearly explains important aspects of the Bhakti Journey with relevance to modern life. “Fabulous speaker! 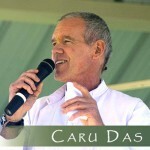 I can’t get enough of Caru Das. Wise, funny, engaging, entertaining and you feel the truth and integrity of his message.